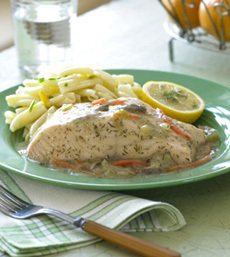 A lemon and dill sauce perfectly complements a piece of salmon. Photo courtesy Good Clean Food. Sauces have been used for millennia to add piquancy and zestiness to plain baked, broiled, steamed and poached foods. A sauce is a liquid or semi-liquid preparation used either as a gravy or a relish with a principal food item—dessert, grain, protein or vegetable. Use the Contact Us form on this page to tell us about your favorite sauces. Find more articles on Blog.TheNibble.com.